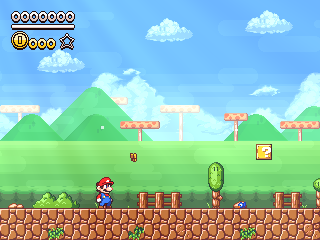 Super Mario Flashback is a Mario fangame that combines the mechanics of 2D and 3D Super Mario titles. This is a test build of the new engine, showcasing the changes to the game, as well as the new art style. Nothing here is complete, and several things such as the level design and the background will be changed later for sure. There might be some glitches and such as well. It's a fantastic engine and the graphics look great! It plays very smoothly. Although I have a few problems and recommendations. -When you stomp on a Helmet Goomba the helmet vanishes from existence like some enemies in SML1, Maybe you could show the helmet flying of like a normal enemy getting killed. -I think instead when a Koopa gets killed by any other means it shows there normal pose like any other enemy, Maybe you make it so that it's there shell pose instead like what happens in most other 2D Mario games,(This should also apply to other shelled enemies.) I've always liked that visual effect more. And maybe you could include other types of colors of Koopas as well? -I also think when you kill a piranha plant they should pop into a puff of smoke instead of flying of like a normal enemy. -And also change Mario's color when collecting a fire flower so people can tell Mario has a fire flower. -When I tried to run a carried shell into an enemy, I took damage and entered a state where Mario was in his carrying position and couldn't get out of it! I think you should program in killing an enemy by carrying a shell/other enemy into it. -When I died the Music loop didn't stop and the music was playing over the continued loop! and this stopped when I reset the game, and then the problem was gone after that. -When at the final section with the note blocks. I cant reach the coins above nor can I get out! Could you make the note blocks bounce you like 2 tiles higher? Thank you for listening! And I can't wait to see the finished product! Pretty solid engine man. You should use it to make an original game, make some dough. Wanted to ask if you made this in Gamemaker, and if so how'd you go about tiling for the higher resolution output? Are these tiles 16 pixels, or is the whole game scaled larger? Pretty great, well done Mors. I can't open the game. It's normal? Definitely has the makings of an amazing game. The only bugs I noticed are that at certain intervals the background music will start up while it's already playing, creating a nasty overlap, and the lack of a fire-throwing animation for when Mario is in the air. Interesting! The demo looks and sounds great, but there definitely a few serious issues. First, the music plays again when you die, starting another overlapping loop until you use Alt+R. For some reason, this doesn't happen every time, but it's pretty common. Second, the hit detection on some of the enemies are, to be blunt, bad. On the one hand, I've clipped into a Goomba without being affected; on the other, landing on Goombas hurts you more often than it kills them. Finally, this may be a more nebulous complaint, but the physics don't quite feel... Mario-like, I guess? They're not quite precise enough - they're a bit floaty and slippery. Well that's probably your problem! The program your using probably doesn't work as well as on an actual Windows OS. I've played this and I haven't come across any problems with stomping Goombas, they get stomped just fine when I played it? ¯\_(ツ)_/¯ This is why I don't like people using WINE on a WINDOWS program. If it broke, get a Virtual Machine or dualboot! It's not a bad game. I do agree with some of the people here, though. The physics are really slippery causing unneeded difficulty. If the physics were more precise, this would be better. As I said, not a bad game. Also, aren't engine tests not allowed to submit as games on MFGG? Kinda, only the ones that don't have a full level are not allowed. This one at least has a full level you can finish. We will not accept "engine tests", in which all you can do is walk around and test out basic elements. Demos, or yet to be completed games, must contain at least one full-length level for a developed engine and at least two for a more basic one. Also, the physics are as slippery as most of the original games and I don't see a problem at that. Having extremely tight controls in a Mario game isn't exactly a good thing. What are you talking about? The controls aren't THAT slippery? Just barely even considerable as slippery! Super Mario World's controls were a tad bit slippery. But this engine is so much better than Hello's Engines! Now those are bad! Why did literally everyone use his crappy engines? What are you talking about? The controls aren't THAT slippery? Just barely even considerable as slippery! Super Mario World's controls were a tad bit slippery. But this engine is so much better than Hello's Engines! Now those are bad! Why did literally everyone use his crappy engines! This game looks promising but can you in just in global game settings at windows tab at vertex buffer method put compatible not fast because this would help with older systems. When it's on fast i only see black screen. Please change fast to compatible. C:\Users\Felipe\Desktop\Flashback Engine Test 2\memory(99,14): error X5608: Compiled shader code uses too many arithmetic instruction slots (78). Max. allowed by the target (ps_2_0) is 64. Step 1:Download Linux or MacOS.